I invite you to spend some time looking at the image. It is a tree in an urban setting, where the roots are above the ground, and wending their way through the cracks in the pavers in the footpath. The roots themselves are shaped by the pattern of the pavers. The tree and the landscape have become interwoven. It’s a great image to think about ourselves and our shared mission and ministry here in the heart of the urban landscape in the city. It invites us to consider how we are embedded in this landscape. Let me offer two pathways. Firstly, when Jesus calls the disciples, he is in many ways asking them to ‘uproot’ from family, friends and familiarity and their work. To disentangle themselves from familiar patterns and pathways. In the ancient world, extended family and one’s community was central to one’s being, but Jesus calls them to leave that behind and to be embedded in a new pattern of community, the kin-dom of God. Perhaps the call for us is to disentangle ourselves from patterns and practices in our social relationships that don’t reflect the hospitality of Jesus, and from political patterns and practices that we find don’t reflect the commitment to peace, justice and the common good. The same may be said about disentangling ourselves from familiar economic patterns and practices that we have adopted as normative, with assumptions about how we acquire and use financial resources. When Jesus calls the disciples, he is literally asking them to uproot and to follow him, to establish new pathways, to root their lives in a new pattern that Jesus invites them into, to widen their social circles, to critique systems that exclude and fail to give priority to the common good. The sobering reality is that in their behaviour and impact upon the world, Christians are not much different than other people. The culture in which we are embedded slowly reshapes us; do followers of Christ have capacity to influence the culture? Perhaps this is something to give attention to: what guides the patterns of your own living? What needs to be uprooted? What are the distinctive teachings and practices of Jesus that invite you to new patterns in your living and your relationships? Now, here’s another way to view the same thing. Perhaps the two perspectives may co-exist? ‘Exile’ was central to the Hebrew people’s self-understanding. People like Joseph in Egypt, Daniel in Babylon, Esther in Persia, all lived in foreign lands, and adopted some of the patterns of their host cultures’ values and practices while remaining faithful to God even in contested space and contested values. They helped shape their adopted culture. The prophet Jeremiah wrote to the Babylonian exiles to warn them that their exile may be long and gave this wisdom to them: “Build houses and settle down; plant gardens and eat what they produce. Marry and have sons and daughters; find wives for your sons and give your daughters in marriage, so that they too may have sons and daughters. Increase in number there; do not decrease. Also, seek the peace and prosperity of the city to which I have carried you into exile. Pray to the Lord for it, because if it prospers, you too will prosper.” (Jer 29:5-7). In other words, be good citizens. Make a home. Raise your family. Contribute to the common good of the community. 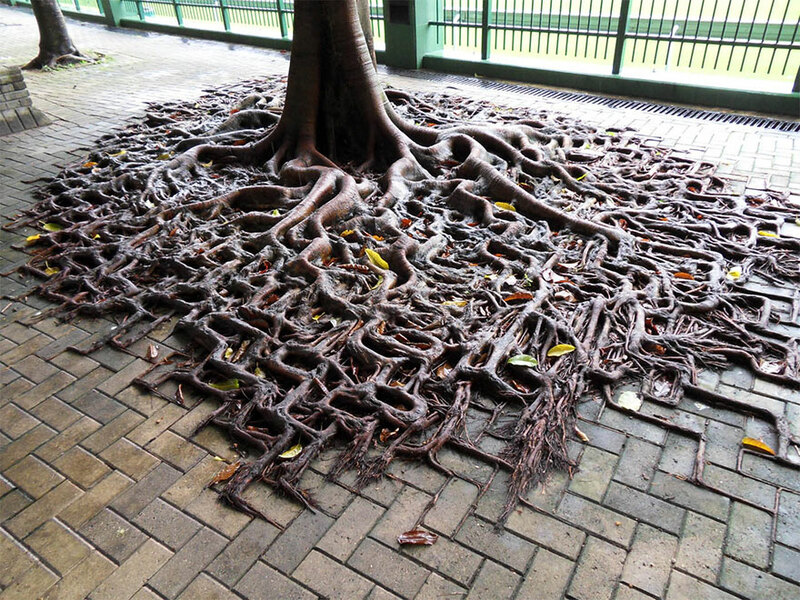 This image of the roots of the tree slowly winding their way through the pavers perhaps serves as a wonderful image of being embedded in the culture in which we find ourselves. The question for us may be: How do we remain faithful as followers of the way of Jesus while also seeking to live as productive citizens in a global village that is post-Christian, post-modern, post-truth, and in a particular cultural setting in Australia with its own narrative about what defines the culture. Mike Frost comments: What we need now more than ever is a forest of “exiles” who put down roots deep into the soil of their host empire, and who model an alternative ethic, an ethic of peace and justice. But we don’t do this in some secret field. We do it in city squares, school yards, university campuses, offices, work sites, town halls, pubs, and street corners. It is public ministry, public theology. There have to be visible roots that show our alignment with and our enjoyment of the culture that hosts us while at the same time modelling the way of the Christ, and critiquing aspects of the culture not in alignment with the ways of the kin-dom of God. Called to be in the world, but not of it. To recognise that suffering, fear, violence, injustice, greed are the antithesis of the gospel that speaks about freedom, reconciliation, justice, forgiveness, and a commitment to the common good. That the reign of God has dimensions that will demand a critique of practices that are assumed to be normal in our global village. That it is not acceptable that 8 people – 8 men, including Microsoft chairman Bill Gates and Facebook founder Mark Zuckerberg, own the same amount of wealth as the poorest half of the world’s population according to a new report from Oxfam entitled An Economy for the 99 Per Cent found the incomes of the poorest 10% of people increased by less than $3 a year between 1988 and 2011, while the incomes of the richest 1% increased 182 times as much. And since 2015, the richest 1% has owned more wealth than the rest of the planet. Half the world lives on less than $3.34 a day. It is one example amongst many where following the way of the Christ necessitates a critique of systems that unfairly disadvantage the poorest and most vulnerable people. The same can be said of Government cuts to financial support for the poorest and most vulnerable people, including in pensions. Richard Rohr comments, “The majority of Christians are not highly transformed people, but tend to reflect their own culture more than they operate as any kind of leaven within it. Most Christians do not reflect the “mind of Christ;” thus they often reflect the common mind of power, greed, and war instead”. Diana Butler Bass says, ‘What will make a difference to the future is awakening to a faith that fully communicates God’s love – a love that transforms how we believe, what we do, and who we are in the world”. Today, God, you create me anew; today I inaugurate a new life. I do solemnly swear that I will faithfully execute your call in my life, and will to the best of my ability uphold your commandments. with reverence and forgiveness toward all people. I will practice humility, generosity and truthfulness. and the oneness and sacred worth of all living things. I pledge to live, speak and act for justice and peace. I will stand against all violence, disrespect and bullying. and include those who are outcast. I acknowledge that I shine with your light, O God, that my life is not mine but yours. for your sake and the sake of the healing of the world. and that the culture will resist me. With your help and those of like mind and heart, I will persevere. I give you thanks. I ask your blessing. I trust your grace. Amen. Here in this church, the call as a community and as individuals is to give witness to the way of the Christ here in the heart of this city. It is also our call to model an ethic of peace and justice, compassion, hospitality, inclusion and welcome, to the wider community, to the nation, and as citizens of the global village. It is no small thing. It is our life’s work. May it be so. Amen. Diana Butler Bass, Christianity After Religion: The End of Church and the Birth of a New Spiritual Awakening (HarperOne: 2013), 37. Richard Rohr, an unpublished talk, Canossian Spirituality Center, Albuquerque, New Mexico, December 3, 2016. Our faith journey, and our life on the road as a Pilgrim community, are marked by beginnings and endings. There are moments when we take a new path, times when we stop, pause and realise that we have arrived at an end point and that we are ready to begin a new phase in our ministry. The UCA pattern of calling and placing ordained ministers* is one expression of this rhythm of community life. Congregations as well as ministers also experience these moments when we take time out, step back from our routines and discover new directions: when we work with the changes needed to strengthen and equip us for the calling, the vocation of time and place where we find ourselves. A changing context, when we are impacted by the wider social changes and attitudes in the society or a new decade or a new year. Today we are celebrating the normal human experience of beginnings and endings for us as individual members and as a congregation. 2017 will be for us a special anniversary year when we stop, reflect and be thankful for being part of the UCA over the past forty years. It would be interesting to hear again some of the discussion that took place at that time when this congregation chose the name Pilgrim and how this has shaped our DNA as a people on the way to a promised end. Or we could explore how this 150 year old building has been the home and sanctuary for many, a place of beginnings and endings, celebrated by families and the wider city. Or we can again be thankful for those, who 180 years ago, covenanted together and formed the first Wesleyan and Congregational fellowships in the province of SA. Setting up their tents on the banks of the Torrens with a commitment to make this place free from class association or inherited privilege. Some days, when in discussion with leaders of the Chinese Church I sense that their experience is similar, establishing a new home and embracing the opportunities that comes with new beginnings in a new land. Beginnings and endings are of course following the pattern of the discipleship which is the primary image of the people of God for over 2,000 years. We indeed are not walking alone, we share with others who are on the same journey, others with different traditions living their life on the road; coming to turning points, facing new directions, mapping out the road ahead. And what a moment at the beginning of this year to follow again the story that begins with Bethlehem and then on to Nazareth, to the sea of Galilee, and within just a few short weeks, an ending on a hill outside Jerusalem’s city wall but then again a new beginning for those on the road to Emmaus when they stopped, listened, shared a meal together and their eyes were opened. In these few short weeks from Christmas to Easter our primary or foundational story is about a discipleship community being shaped, formed, chosen, called, invited to take to the road, a people part of a new movement in history. Researchers who have set out to write a biography of Jesus of Nazareth have often expressed the limitations that come with this task, the story of the Jesus of history and the Christ of faith. We know so little about his family, the carpenter of Nazareth, his faithful membership of the local synagogue. But there are enough hints at what is to come… one day for example in his home town, reading from Isaiah, he has anointed me to bring good news to the poor. He has sent me to proclaim release of the captives and recovery of sight to the blind, to let the oppressed go free. (Luke 4:8). The gospel stories touch on the parallels and similarities with the journey of his people out of Egypt through the waters of sea, a people forged in the wilderness to become a covenant people with a purpose and a calling. And today, a baptism that identifies with our humanness. One who was called to be with others of his day who turned their lives around and took up a new purpose. Here in this moment, there is a new beginning, a calling, a vocation, a new path to tread, a new witness to justice and truth. A servant calling and an invitation for all to follow, to walk the servant way, a mission to change history that begins with the lowest in the most out of way places: ministry to embody the promise of Isaiah, “here is my servant and I have put my spirit on him and he will bring forth justice”. 42:1. And this vocation is indeed like passing through the water, going under and coming out on the other side to freedom and deliverance. A counter-cultural movement founded on love of the neighbour, welcome to the stranger, standing with the broken and lost, those left on the side of the road. In looking back over these past few years we can affirm again that we are indeed a Pilgrim people on the way. How we have experienced those moments – when we have discovered how to begin again, to reflect and learn from our experience, to celebrate what we have discovered by being together, to be thankful for our travelling companions as we have acknowledged, received and affirmed the gifts we each bring to our ministry in the city. Moments when we have discovered that our baptism was the beginning of a vocation of service, ministry in the name of the One who was called by God’s Spirit and blessed by the descending dove, a sign of peace given to be shared with all. Both then and now we hear the call to a mission of reconciliation and new beginnings. Thanks be to God!